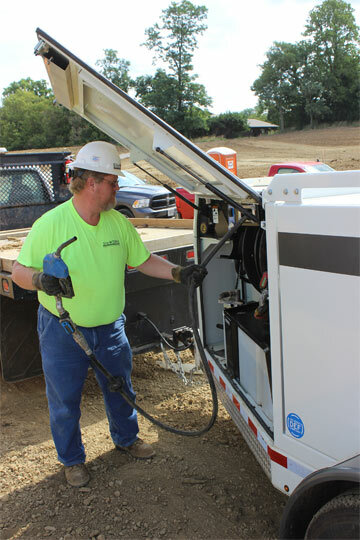 While diesel exhaust fluid is not hazardous, proper management and handling practices are required to prevent contamination that can have serious effects on machine health and performance. Diesel exhaust fluid (DEF) is not volatile – it’s non-combustible, non-hazardous and not a pollutant – but if contaminated or improperly managed it can have significant consequences for engine emissions solutions that rely on selective catalytic reduction (SCR) technology. Some heavy equipment managers have been able to put off the acquisition of equipment with SCR technology by extending the service life of existing equipment. That strategy might be effective now, but much of the equipment being introduced today at 75 hp and above requires DEF. Managing and handling DEF should not, however, be viewed as a burden. The right combination of education and technology can take the risks out of DEF handling by the equipment owner. And as long as fluid is purchased from accredited sources and managed properly through the supply chain, it poses no risk to high-horsepower heavy equipment. The catalyst found in SCR systems is made of rare metals such as tungsten, vanadium and zeolith. When DEF is injected into the exhaust stream, it converts to ammonia. The ammonia and exhaust enter the catalyst and produce a chemical reaction with nitrogen oxide (NOx), converting it to water and nitrogen (completely inert) before releasing it through the equipment’s exhaust pipe. That ammonia is corrosive to contaminants such as aluminium, copper, chromium, iron and nickel. If there are trace elements of those contaminants in the fluid, they will get trapped inside the catalyst. As the DEF keeps coming in and the ammonia keeps entering the catalyst, those trapped minerals and the resulting corrosion will essentially cause the catalyst to rust from the inside out. To use the human body as a comparison: If I go in for knee surgery tomorrow, and that scalpel is not clean and sterile, I may get an infection. That infection will grow and grow over time until it makes me ill. The same thing can happen with the contamination and corrosion in the catalyst. Once that happens, it cannot be repaired – only replaced – and the catalyst can cost thousands of dollars as well as the downtime associated with repairing and replacing it. Contaminants present in the DEF can also clog spray nozzles and plug up the pump and injection system over time, causing the system to not work properly and affect shelf life. How susceptible is DEF to contamination? Less than one teaspoon of many common elements is enough to bring an entire 5000 gal. tank of DEF off-spec, according to the ISO 22241 standard. These contaminants include copper, zinc, chromium, nickel, iron, aluminium, phosphorous, magnesium, calcium, sodium and potassium. Even something as simple as tap water can bring DEF off-spec. It is also important to avoid aldehyde. This is why automotive-grade urea is specified in the production of DEF. Automotive-grade urea does not include the same preservatives found in more traditional urea used in fertilizers. The presence of that preservative will gum up the catalyst. This, in part, is why DEF has a shelf life – the preservative has been removed. DEF quality – production (5%). DEF quality – logistics chain (10%). DEF quality – customer handling (70%). Three of those factors can be directly influenced by how contractors choose to source, handle and dispense DEF. DEF that meets all required standards is always comprised of 67.5% de-ionised water and 32.5% automotive-grade urea. Determining which DEF vendor to work with is as simple as checking labels and making sure you have got the right type of container to put it in. DEF is commonly sold in jugs, 55 gal. drums, 275 gal. or 330 gal. IBC totes and in bulk via fluid delivery services. Contractors should always make sure that the fluid they are purchasing meets the ISO standard (ISO 22241) and is certified by the American Petroleum Institute (API). This ensures that the fluid the fleet manager is purchasing has been subject to strict monitoring and testing established by accredited agencies. Secondly, they should always use a container made specifically for DEF, constructed with materials approved in the ISO standard, and sterilised and sealed properly. A ‘sealed’ container such as a jug that must be opened to dispense should never be reused. A ‘closed’ system that relies on special dry-lock couplers to move fluid in and out without being exposed to the environment is preferred. We still see DEF for sale at truck stops and other locations in open, second-hand containers. Once a trusted source of DEF is selected, fleet managers must determine how they will store and dispense DEF in their operation. This will be determined by the quantity of DEF demanded by the equipment fleet, and if that equipment is able to come to the source or if it must be delivered to the equipment in the field. While the ISO standard allows for open systems for storing DEF, a number of OEMs and industry experts suggest that the closed fluid path solution is the most effective. The challenge with open systems is that the container must be sterilised between each use, which is not practical or likely in construction environments. A closed system – where the DEF is never exposed to the elements until it’s pumped into the machine – ensures total fluid purity. These closed systems can be outfitted on more simple storage and handling solutions, such as an ISO-compliant 50 gal. DEF tote that can easily be placed stationary in a shop, or transported out to the field in the back of a pickup or service truck. There are also dedicated ISO-compliant DEF trailers, and DEF storage and pumping systems built into larger fuel and service trailers. For large fleets with centralised operations, large bulk tanks with various dispensing options are available that can fit in with, or next to, existing fuel islands. Two-in-one pumping systems are available with these solutions that allow DEF to be seamlessly pumped into and out of containers without having to switch to another pump – simplifying the footprint and hassle of these systems. That two-in-one pump also makes it easier to purge DEF back out of the line and back into the tank to prevent freezing in colder climates. There are some equipment owners who have built their own storage and dispensing systems. Thunder Creek does not recommend this practice, but understand why people do it. The company recently became acquainted with one heavy equipment owner who built their own DEF system and used fittings that contained copper, zinc, chromium and nickel – all known contaminants to DEF. Due to issues experienced with their DEF systems and this homemade container, the company eventually had to shut eight machines down for two days at the cost of US$50 000 in lost revenue. All components of a DEF system should contain ISO-approved materials, such as stainless steel and high-density polyethylene (HDPE). As with other fluids, it is important to keep the workspace, equipment and fill points clean. This is no small task on off-road sites where dirt and dust gets everywhere. Many of the closed DEF systems come with the same kind of dispensing nozzle as found on fuel pumps. This is superior to open systems that require the DEF to be poured out into a funnel inserted into the DEF tank. The use of that funnel provides greater opportunity for contaminants to enter the fluid and the SCR system, especially if it had been used for other service items and contains trace amounts of other fluids, etc. DEF expands by approximately 7% when frozen. Some containers are built for some expansion, and max fill lines should always be adhered to. Prevent fully filled, closed containers and pumping systems from freezing as this can cause damage. As mentioned earlier: DEF can be easily purged back into the tank after filling the machine using a two-in-one system. Be sure DEF is completely thawed before use. Do not use additives to prevent freezing as this can lead to contamination. As mentioned earlier, DEF does have a shelf life due to the absence of a preservative. It is generally, however, a lengthy shelf life as long as the fluid is stored properly. Prolonged exposure to direct sunlight and high temperatures will cause DEF to degrade. DEF retains its full quality for 36 months when stored at or under average temperatures of 50°F. This reduces to 18 months at 77°F, 12 months at 86°F and just six months for DEF that is consistently exposed to temperatures above 96°F. Most fleet managers, especially larger fleets where there is a consistent flow of equipment being serviced, will rarely encounter a situation where DEF is stored for periods longer than six to 12 months. Buying in bulk can provide cost advantages, and larger fleets can still process those greater quantities in a year’s time – and few storage environments feature consistent temperatures that high. Increased DEF consumption in equipment. Loss of its effectiveness to remove nitrogen oxide from engine exhaust. Malfunctions with the SCR system. The engine de-rating or shutting down. Voiding of the manufacturer’s warranty – numerous engine and equipment OEMS have called out DEF quality as an uncovered expense in the instance of system failure due to poor quality/uncertified DEF. 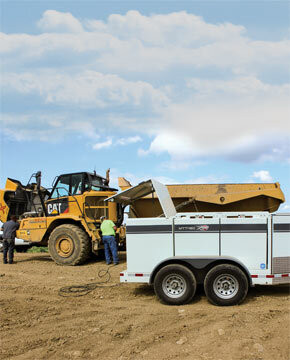 Equipment using contaminated DEF will consume more fluid and be less effective at reducing emissions from the exhaust. Most importantly, contamination will damage the catalyst in the SCR system over time, potentially causing the engine to shut down and leave the machine idle. Properly managing DEF and maintaining fluid purity requires a delicate balance of education and technology. Fleet managers must work hard to remind their technicians, operators and field personnel about best practices for handling and dispensing DEF, but they must also equip them with the right tools to do so. One without the other will lead to diminished returns. Purity is irrelevant without proper handling practices. When DEF is handled properly, there is absolutely no risk to machinery health or performance. By handling DEF in ISO-approved containers and with consideration to environmental conditions, equipment owners will ensure that SCR-based engines and systems experience optimal uptime and productivity.